One of America's most successful financial and business magazines is Forbes. It was founded by the Scottish newspaperman B. C. Forbes. By 1978, this influential bi-weekly publication had national circulation of 750,000 copies. ■ Bertie Charles Forbes was born May 14, 1880, in New Deer, Aberdeenshire, Scotland. Shortly after his 14th birthday he started working as a typesetter-compositor for the Peterhead Sentinel. The pay was a modest three shillings a week or about 75 cents America. ■ He studied shorthand and two years later took his first job as a newspaper reporter with the Dundee Courier and Weekly News. In 1901 he emigrated to Johannesburg, South Africa, where he and Edgar Wallace founded the Rand Daily Mail. ■ After three years in South Africa, he moved to New York City where he became financial editor of the New York Journal of Commerce. Later he joined the staff of the New York American as financial and business editor. He also worked as a syndicated Hearst columnist. ■ He decided to strike out for himself, seeing the need for a top notch American financial publication in tune with the growing affluence of the nation. The result was the foundling of Forbes magazine in 1917. ■ Under the direction of his son Malcolm, the magazine doubled its circulation in less than 25 years after his father's death on May 6, 1954 in New York City. Grandsons are involved in the business. B.C. 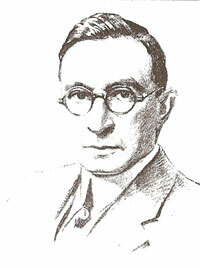 Forbes was the author of many books on finance and industry. ■ He never forgot his native village of New Deer and even during the depression of the 1930s he helped to support the church there. The baptismal font in the church is dedicated to the memory of B.C. Forbes.